Oct 2018: UNZA-UCLMS is delighted to announce that 'Sir Ali' has been awarded the Union Medal at the 49th Annual Conference of the Union Against Tuberculosis & Lung Disease, in The Hague, The Netherlands, this week. 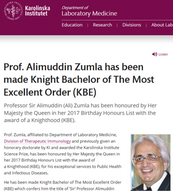 Jun 2017: UNZA-UCLMS is delighted to announce that Prof Alimuddin Zumla has been honoured with a Knighthood by Her Majesty Queen Elizabeth II in recognition of his many years of exceptional service for public health and combatting infectious diseases. May 2017: UNZA-UCLMS is sad to announce the demise of one of our founding directors, Prof Chifumbe Chintu, on the 4th May 2017. May his soul resit in peace and our deepest condolences to his family and friends. 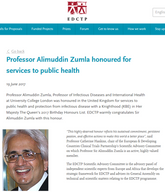 May 2016: UNZA-UCLMS Founding Director Prof Alimuddin Zumla award honorary doctorate by the Karolinska Institutet, their highest honour. Mar 2015: Matthew Bates & Aaron Shibemba present UNZA-UCLMS autopsy data at the first Asian-African Mycobacteriology Congress in Isfahan, Iran. Nov 2014: Alimuddin Zumla (UCL), Stefan Kauffman (Max Plank) and Eric Rubin (Harvard) have co-edited a new comprehensive TB book with Cold Spring Harbour press. 3rd-4th April 2014: Professor Zumla commences appointment to EDCTP Strategic Advisor Group. For this and other EDCTP news see newsletter. 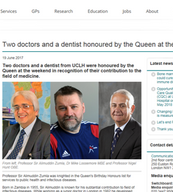 24th March 2014: Baron Lord Patel of Blackburn hosts Professor Zumla and international delegates visiting the U.K to present at the UCL/LSHTM World TB Day symposium, for a tour of the House of Lords and House of Commons. 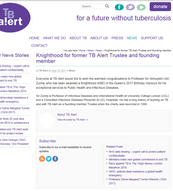 21st March 2014: Professor Zumla collaborates with Andrew George MP and Baroness Masham to publish a tuberculosis commentary in the Lancet (PDF) to mark World TB Day 2014 (24th March). Univeristy College London and The London School of Hygiene & Tropical Medicine will hold an exciting day of talks held in the John Snow Lecture Theatre, on Keppel Street in Bloomsbury, London. The event is FREE. To register click here. 29th Nov 2013: UNZA-UCLMS wins the 'Best International Collaboration' award the Times Higher Education AWARDS in a lavish ceremony at the Grosvenor Palace Ballroom. Prof Ali Zumla was accompanied by Dr Matthew Bates and other members of the ADAT study team. 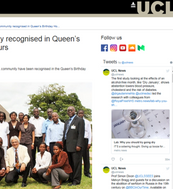 A huge thanks and congratulations go out Prof Michael Hoelscher, Leonard Maboko, Petra Clowes and the Tanzanian project team, and also to Peter Mwaba, Dr Nathan Kapata and the Zambian project team. 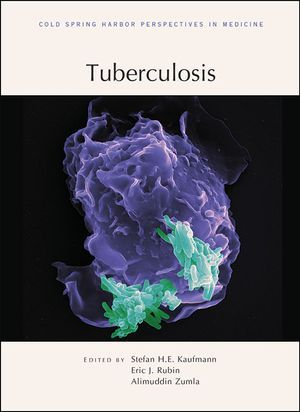 25th Mar 2013: World's TB experts come together to publish comprehensive review series in Lancet Infectious Diseases to mark 'World TB Day'. 17th Dec 2012: Kapata et al... publish in J Trop Paed, showing declining TB notification rates in children in Zambia, but highlight the absence of HIV co-infection and MDR-TB surveillance data.